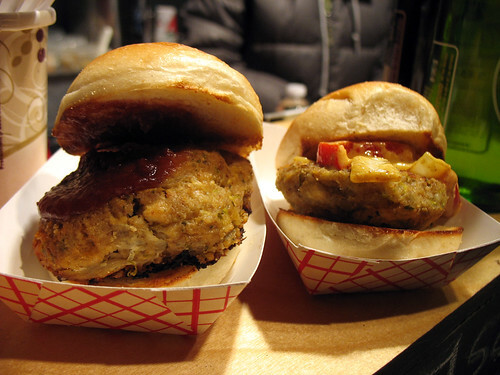 Question of the Day: Does a meatball slider count as a burger? 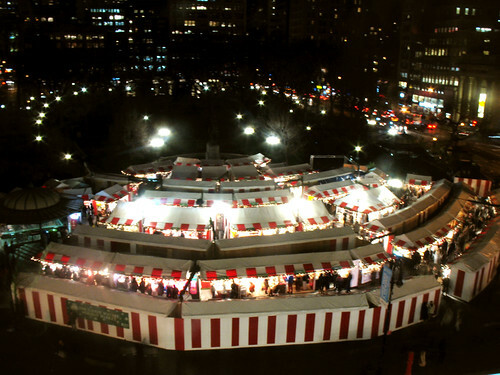 I confess, I have a sentimental weakness for the Union Square Holiday Market. Sure, it’s a lot of the same stuff year after year and it’s way overpriced and I rarely even make any purchases… but I love just walking through the festive atmosphere and looking at all the beautiful things under all the holiday lights. 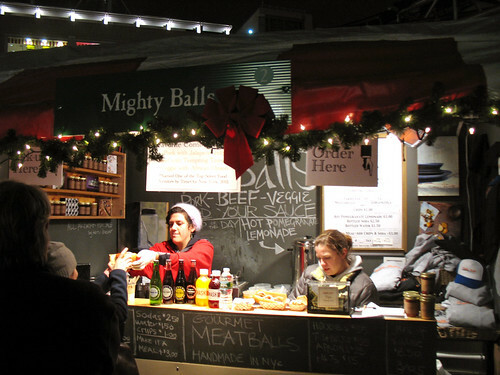 This year, a new vendor caught my eye – Mighty Balls (har, har), serving gourmet meatballs on heros and sliders. Sliders! That means burgers, right? Their menu said they had veggie balls. So I decided that, even though you could argue it’s not really a burger, I had to try them. I ordered two sliders – you get to choose your balls and your sauce, so I got African Onion sauce on one of my veggie balls, and Cranberry Horseradish on the other. All of the sauces are vegetarian except for the “Not Your Average Brown Sauce” – which I appreciated the vendors warning their vegetarian customers about. The balls themselves contain egg and cheese, so they’re unfortunately not vegan-friendly. They look like burgers to me! The Onion Sauce was definitely the better of the two – saucy and tangy and the perfect compliment to the patty… er, meatball, I mean! And it had peppers and pieces of onions in with the sauce, so it was more than just liquid poured over the meatball. 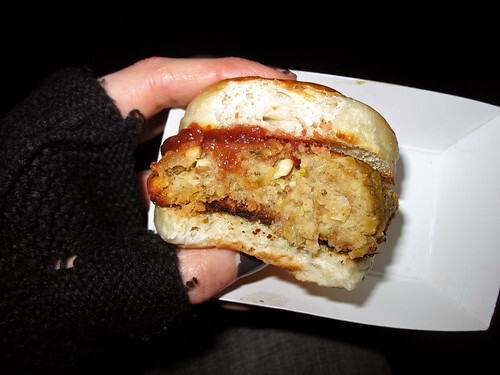 The Cranberry Horseradish was tasty but there wasn’t enough of it on the slider, so that one ended up being too dry. The buns were light and sweet, easy to hold, kept the balls and sauce safely inside with minimal oozing out the sides, and were the perfect size to accommodate the veggie balls. The veggie balls themselves were a mixed mash of vegetables (I couldn’t really identify specific ingredients), fried on the bottoms, which really brought out the taste of the cheese in them. I probably would have appreciated this more if I still ate dairy with any regularity, but since I hardly ever eat cheese now I’ve kind of lost my ability to enjoy it. The balls were a little dry, but the onion sauce at least made up for that on one of the sliders. Mighty Balls just opened last spring. They don’t have a brick-and-mortar location but they describe themselves as a “mobil vending company” and sell their meatballs at fairs like the Holiday Market and the Hester Street Fair, and do catering and other events. Check their website to find out where you can find them next. 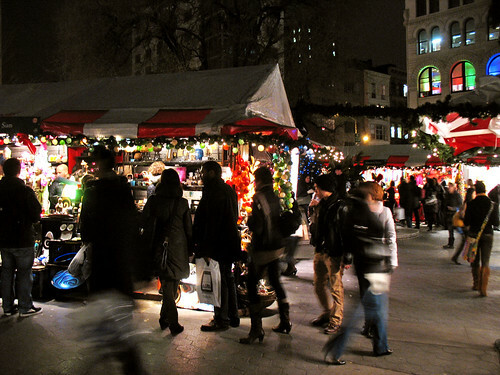 Currently selling at the Union Square Holiday Market until Christmas, December 25th. Check their website for other upcoming events and locations. Anything on a slider bun counts as a burger, in my opinion!